With the cost of everything at the grocery store skyrocketing consumers need to start figuring out ways to make their favorite foods at home. My dad recently shared a healthy chips recipe that definitely fits in with this philosophy. The following healthy chip recipe is not only better for you than the store bought version but is very cheap and tastes great. The only items needed to make these homemade chips are a microwave, a plate, a knife or multi-slicer, cooking spray, salt and one to two potatoes. The main ingredient in this healthy chips recipe is the potato so lets talk about that first. I have tried many different potatoes with this recipe so it really does not matter what type you use. I have used big Russet potatoes from the store and also potatoes that have been grown in the garden. Potatoes from the garden are obviously my first choice when making this healthy chips recipe but a couple bucks for ten pounds of potatoes sure beats a bag of chips if you don't have a green thumb (we can work on that). One large potato will make enough chips for two rounds of chips for my family. To make the healthy chips, slice the potato in to as thin as slices as possible. I use a multi-slicer I purchased at the store which works perfect for this. My multi-slicer cuts up any type of veggies plus also makes fries so it was a nice addition to my kitchen collection. I recommend purchasing one but a good ole fashioned knife will also do the trick. 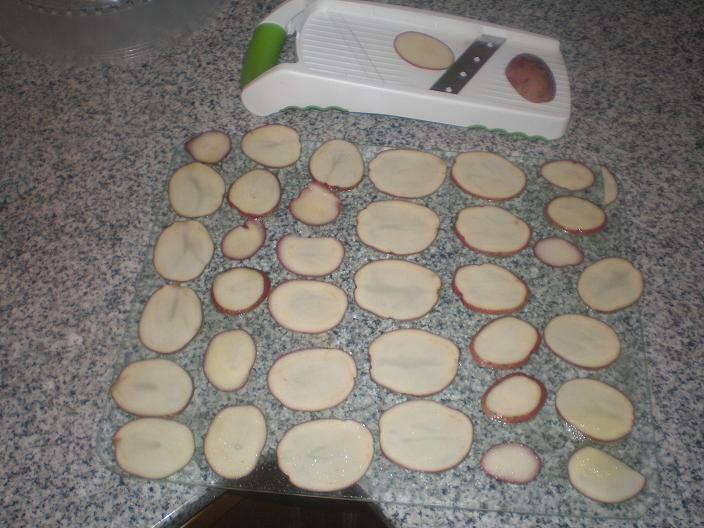 Once the potatoes are sliced, spray a microwavable dish with cooking spray and place the potato slices on it. Make sure to not crowd the potatoes. This means to make sure that none of the potatoes are touching. If any of the potatoes are touching, the cooking process will take much longer. I like to make as big as a batch as possible so I use a plastic cutting board that is dishwasher safe to make my healthy chips. If you only want to make a single order, a plate works just as well. Once the potato slices are on the cooking surface, spray them down with cooking spray and stick them in the microwave. All microwaves are different so you will have to play around with yours until you figure out how long the chips need to go in. My microwave is fairly new and will make a plate full of chips in four to five minutes and a big batch on the cutting board in about fourteen. However, it is always a good idea to watch the batch for the last couple minutes because the chips can go from not cooked to burnt in about a minute. Once the chips are cooked to your liking ( I prefer mine so that all the chips are brown) pull them out of the microwave and immediately salt them to your liking. It is always a good idea to salt your food right when it comes out of the microwave because that is when the food is most vulnerable and the salt will soak in the best. Check out those tasty morsels! Once the chips cool down, serve them to yourself or your loved ones and enjoy. For less than a dollar you can make as many chips as you can handle in a sitting.